Hong Kong isn’t just busy. It’s crazy. It runs at several thousand miles an hour, all the time, and visitors frequently comment on the pace of our lives. But that’s what happens when you put 7.1 million high achievers into one cosmopolitan city – frenetic activity levels that just won’t let up. To get headspace we’ve tried yoga, running up the Peak, meditating, sunsets in Sai Kung and walks on Lamma. Hell, we’ve even tried to find that mythical sage out in Yuen Long who, according to the potentially-true-possibly-made-up-but-maybe-not-lore of Kowloon, can distribute a herbal healing tea that will restore all life balance. No luck so far. Enter Float On HK: the closest as you will get to becoming the star of Gravitywithout actually being George Clooney. The ‘sensory deprivation’ centre was launched earlier this year by husband and wife team Dee Cheung and Ciaran Hussey, who wanted to make it as easy for those living in the concrete jungle to de-stress. The technique of floating as a form of pausing and retracting from the constant overstimulation of modern life is known as flotation-REST (Restricted Environmental Stimulation Technique) and is said to assist in entering a state of deep mental and physical relaxation. You cannot answer telephones, check emails, scroll through Instagram, listen to music, watch a film, or engage with any other stimuli for an hour as you float in one of the centre’s four DreamPods. 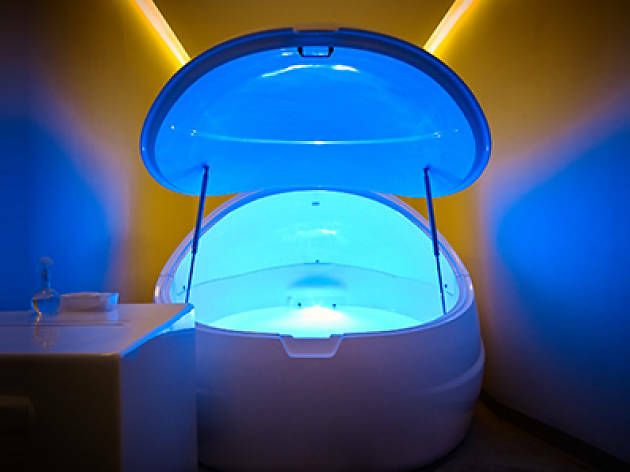 These giant, luminous pods are filled with water heated to 34 degrees (roughly body temperature), and each pod contains a whopping 500kg of dissolved epsom salt and magnesium, ensuring you float and feel as though you’re in a zero gravity environment. Intrigued but trepidatious, we book an appointment, took our shoes off at the door of the Caine Road centre, sign a waiver forms (the trepidation increases), and are shown into the ‘earth’ room, which contains a shower in the corner and the giant, luminous pod... thing. It looks somewhat like a giant ceramic duck egg that has been sliced in two, with the bottom half filled with a slightly rippling water and a soft luminescence emitting from one end. 2 minutes – Oh wow, it is really buoyant. Look at that my legs just float right up. And my body. What am I supposed to do with my arms…? 3 minutes – Guess I will just let them float here by my side then. 4 minutes – Well this is quite nice. It’s kind of being like being in a sizeable spa bath with music playing under the surface. How relaxing. 6 minutes – [Bashes into the side of the pod.] How do I stop myself ricocheting off the walls? They should have provided me with an anchor. A teeny little mini anchor. An anchor for ants. Has Zoolander II come out yet…? 7 minutes - Focus. You are meant to be mediating. Okay bearded instructor man said to concentrate on breathing. In and out. In and out. 8 minutes – This music is great. I feel like I am on Inle Lake. An hour is a really long time though. I can bake a lot of things in an hour. Like cookies. Cookies are great. Cookies. 8-and-a-half minutes – You are an awful meditator. Try doing a body scan. Start with your hair, and now your forehead, and your eyebrows…. 9 minutes – Oh no, the music is fading. Please don’t stop the music. Music….music….music. It’s getting late, I’m making my way over to my favourite place– DAMMIT, Rihanna. 10 minutes – Well, there goes the music. It’s just me and my thoughts now. 11 minutes – Who am I…? 12 minutes – Is this what happens when we die? Everything is so black. 13 minutes – I think if this was what being dead was like, the difference between heaven and hell would be the music played. In heaven you get to listen to a combination of Earth Wind and Fire plus various Jeff Buckley albums. In hell it’s Nickelback. On repeat. And occasionally the chorus of Complicated by Avril Lavigne. 14 minutes – Are Chad Kroeger and Avril Lavigne still dating? 15 minutes – Ok. Bodyscan. Back to the eyebrows, and now your eyes, then your ears and nose…. 16 minutes – People who are claustrophobic should NEVER do this. 20 minutes – Did you just fall asleep? Can you even do that in this thing…? What if I drown..? Apparently drowning is supposed to be a peaceful way to die. OH MY GOD THIS IS HOW I DIE. 21 minutes – What should I eat for dinner? 22 minutes – This is living. 23 minutes – Am I turning? Am I slowly rotating or staying in the exact same place? I can’t tell. 26 minutes – Maybe I should try some different positions. Let’s try that one with your feet touching and your knees out. What’s that called..? Reclined bound angle. Let’s do reclined bound angle. 27 minutes – Well this is fun. I’m like an astro-yogi. 29 minutes – Astronauts must see some crazy stuff. 30 minutes – How long have I been here? This is like that planet scene inInterstellar with time and space relativity. Yes… I’m definitely on a quest to save the human race while I bob around in this little egg. 32 minutes – Gravitational anomalies though. What is UP with that..? 40 minutes – Did I just fall asleep again? Was it my own snoring that woke me up? This is why you’re not married. 43 minutes – I’m thankful that kittens and sloths exist. And ants. Ants don’t get enough credit. 46 minutes – Sandra Bullock would be all over this. 49 minutes – I feel like I am in the early stages of being brined. I wonder if this is how capers feel. What the hell are capers anyway? Are they peas? 51 minutes – You are so bad at this. 53 minutes – This is truly the closest we'll ever come to being back in the womb. 54 minutes – The music, the music is coming back. How has it been an hour already..? I am quite enjoying this… I don’t want it to stop. Stop playing the music! 58 minutes – Alright I am ready to get out now. 60 minutes – If you wanted to get out of a big ceramic egg how would you do it? Channel baby bird. 61 minutes – Oh right. Here is the luminescent handle. 64 minutes – I think I have forgotten how to walk. I feel like a newborn calf. Or a woman attempting to walk down Lan Kwai Fong in high heels. 65 minutes – So much salt. 2. Very clear in thought. 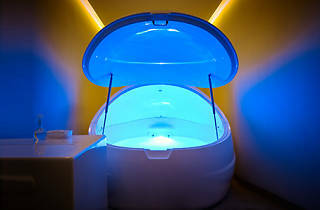 The Float On HK experience is said by its founders to stimulate four hours of sleep, encourage magnesium absorption which, it’s claimed, can have many positive effects on the body such as de-stressing and lowering blood pressure, reducing lactic acid build up, increasing the production of endorphins, slowing brain waves and increasing mental focus. Float On HK 89 Caine Rd, Central, 2548 2844; floatonhk.com. A 60-minute session costs $630.